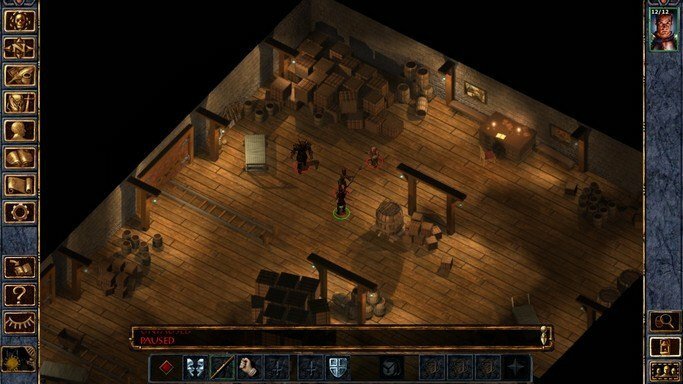 Have you ever wondered why, for all the urgency of having to leave and the imminent threat of assassins, the main character of Baldur's Gate is at leisure to stroll across the grounds of Candlekeep, chatting, delivering bottles of cow cure, exterminating pests, even resting at the inn for days and weeks at a time if he has a notion to? Of course, the out-of-character reason for this back in the day was that the Prologue was a tutorial and only intended to teach players the controls and basic how-tos of gameplay. Nowadays, however, hardly anyone perceives it that way or needs to be instructed. Most players probably go from task to task for a little starting experience, if they do not find them too boring, before setting out at some time. This mod brings the Prologue back in-character and makes the urgency very real. You have one hour - sixty game time minutes - to finish your business in Candlekeep and depart with Gorion; and if you do, nothing will happen. One minute longer, however, and very real killers will show up wherever you are and whatever you may be doing - pick-pocketing idle nobles, fighting illusionary monsters, listening to prophesies of Alaundo and so on. All of those activities are very nice, but other people living it out in the monastery are not in the unique situation of being on a kill list. These assassins are much more competent than the pathetic tutorial-type thugs you already know. For a 1st-level character without a party fighting them means almost certain, but not absolutely certain, death. Most players and their characters will just have to pack it on time. If you dig your heels down and take them on, however - and defeat them - you will be treated to a little loot and some new content. Read the dialogues attentively. The most obvious reward is a new 1st-level spell, Vanishing Act, carried by one of the assassins (you will wish you had it before meeting them). If the battle turns out too difficult for your character and you end up having to run away after all, there are two other places where you can get such a scroll. One is far across a sea and another is in the home of the enemy. Taking the assassins on single-handedly is probably too much for any character, but Candlekeep is still your home after all. Think about who might help you. In the time that you have give people a reason to intervene. It also helps to be well-liked to begin with. Of course, not everyone will lay down their lives for you even then. In addition to all this, I took a hammer and pliers to some other things around Candlekeep. The spell Firebead Elvenhair casts on you to "protect you tonight" will really last into the fateful night, and so on. The best way to play this mod is in a new game, but if you load a save in the Prologue, the timer will start from there. You will not be able to win people's loyalty for helping them out, though. Now why didn't I get a notification for this reply for this thread that I'm following? Administrators? I'm not sure whether the mod may not already work with them. Try it. I'm used to using the latest IE technology available, though, which means the Enhanced Editions. I use whatever functions are on the table to the utmost, and some are not going to work on older game versions. Compatibility may be patchy or it may be complete, there's no telling. You're going to hear a trumpet when the countdown begins (normally in a new game). But the rest may or may not work. It's too much work to revise everything, of course. Especially if there is no telling even what. You'll just have to risk it or play BG:EE. Not to stray off topic in my own mod's thread, but just what are the principled objections of people to playing the Enhanced Editions? The technology is simply leagues ahead. Those who reject them cheat themselves of a lot of potential, I think, both as players and as modders. Perhaps not in this mod, but I have made some things that simply will not work outside of Beamdog's updated engine. I can think of a couple of fundamental reasons that EEs can't negotiate, like being able to keep globals while playing through Trilogy or the wonderful style of the original BG, loading screens, interfaces, yes, but mostly people seem to be unhappy with the way Beamdog went about changing the gameplay. Ergo, what we need is a rollback mod. To gather ideas about really unfortunate gameplay choices and reverse them. Then most of those who have given up on a future for these games and their tech may be encouraged anew. And we'll be able to ride in the saddle behind Beamdog as they continue to support and, hopefully, expand the functionality. Nobody but a real company has resources for that. ...what are the principled objections of people to playing the Enhanced Editions? This has been discussed many times, over many years. Perhaps before you joined the BG community. So I don't mean to bring up bad history, but just answer the question. I don't have links to many of the criticisms; I don't have links to the best comments -- I'll leave that to others to contribute. For my part, I'll simply note that I have no intention of buying BGEE because it offers nothing of interest to me that I don't already have access to. The bottom-line is that they released a version of Baldur's Gate (EE) which you really have to work...to find any advantages to compared to a BGT-installation with mods, yet with a number of sizeable disadvantages. ...Is BG:EE an enhanced version of the BGT install I have on my computer? No. Just no. My own direct, point-of-view, I'll give the devil his due and say this: I would buy EE versions only if it was just the engine updated. I don't want to see, hear, or smell any EE surface content: no new GUI, no new NPCs, no changed story canon, god-help-us no new cutscenes, etc. If I can play BG1 & BG2 exactly how I've always played them--with just the game engine being EE-ified--I'll buy it. This would give players like me the pleasure to play mods like yours. Which I would totally do, your mod sounds kickass! Pity, I guess that chance won't happen. Which I would totally do, your mod sounds kickass! Pity, I guess that chance won't happen. And what about Dungeon Begone for BG1 ? Talk to the added NPC and skip the Candlekeep if you choose that option. Yes, Termix mod is a bit more involved... but so is all the other mods created ... if they carry an original idea.